These are the true martial classes who, regardless of some the variations in abilities, live and die by the sword. 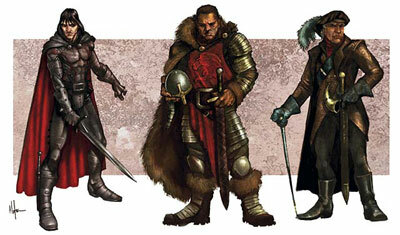 The Warrior Caste is divided into five classes: Soldier-Mercenary, Knight, Templar, Ranger, and Swordsman each of whom have specific strengths and requirements. Warriors, due to their more extensive training in combat, fight on the best table of the Combat Chart, they are the least hampered by use of any weapon or armour choice in the performance of their skills, and have the best hit point potential in the game. These combine to insure that they are the best at dealing and withstanding physical damage in melee. -Specialization: A warrior may opt to use two weapon slots (three for missile weapons) to become an expert in the use of a particular weapon. This expertise gives the warrior a +1 to all attack rolls and a +2 to all damage rolls with the weapons. A warrior may specialize in more than one weapon so long as they have the appropriate number of slots available to devote to it. Those specializing in missile weapons gain a pre-initiative shot, when the bow is aimed and ready as well as a point blank range (60 feet) bonus of +2 to attack rolls. Furthermore, specialists gain additional attack rolls more quickly as they progress (see Experience Table). -No Armour Restriction: Certain skills may be inhibited or impermissible with the wearing of heavy armour (see Ranger and Swordsman) but there is no other restriction placed on the Warrior Caste and so they may wear armour of any type. -No Weapon Restriction: All weapons allowed by the Game Master are permissible to Warrior Caste players with the exception of the Knight and Swordsman who may use bows but not gain proficiency. Furthermore, Warrior classes are the least penalized when using non-proficiency weapons. Any game based on the original Dungeons & Dragons model is going to focus largely on two classes: mages and warriors. It is the intention of this gaming system to keep these two classes largely distinct for purposes of game balance and game play purposes. In this system where several actions by a particular class result in more experience points awarded it was determined that allowing the two classes to mingle skills too easily would make the awarding of experience points more onerous than necessary. Those choosing a class in the Warrior Caste will generally focus on combat, tactics, and the use of martial skills in order to gain experience points, though for some leadership will be important, and for others cleverness may take a strong second to combat. Within each class there is plenty of opportunity to distinguish your character’s personality and unique style for the pleasure of role-playing.